I did a bunch of work on Additional Fees. 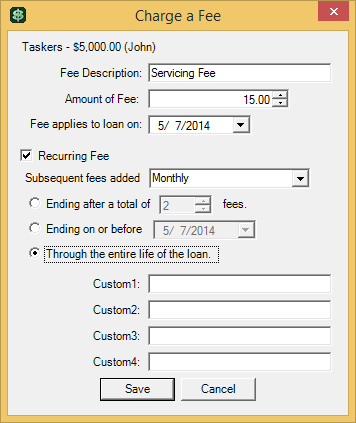 I worked up the form that now allows for fees to be marked as recurring and to set the recurrence schedule. The creation and management of fees is set up, but it still needs to be tied into the loan calculator properly to do what it's supposed to. I also tested and fixed the ability to set a password on a portfolio. When creating a portfolio you can specify a password to open it. Once set, you'll never see your data again… unless you enter the password exactly as you set it. Seems to work very well. To change the password on an existing portfolio in MLP3 is a lot more code, and that code still needs to be written. I also started working on importing templates from template files, but quickly switched to importing MLP2 portfolio data since that'll include templates and is a much more important task. I had written an upgrade system for MLP 2.5, but MLP 2.5 was abandoned in favor of making the leap all the way to MLP3. Some of that code doesn't convey, but some of it - like choosing which 3rd parties to treat as loan servicing fees and which to treat as escrow charges is still quite useful. I have the UI set up, and some small parts of the code that actually converts records written, as well as a nerfed copy of MLP2's file portfolio system to allow reading the records from the old portfolio format. I hope to get data from MLP2 portfolios to copy into the MLP3 format!! !